VLC media player Tha VLC 'na chluicheadair mheadhanan a chluicheas cha mhòr codec meadhain is fòrmar video sam bith a tha a-muigh an-siud. VLMC Tha cruthaiche filmichean VideoLAN 'na bhathar-bog neo-loidhneach a chum cruthachadh video. DVBlast Tha DVBlast 'na aplacaid shimplidh is chumhachdach airson sruthadh is MPEG-2/TS demux. multicat Tha multicat 'na shreath de dh'innealan a chaidh a dhealbhadh a chum làimhseachadh furasta is èifeachdadh de shruthan multicast is TS. 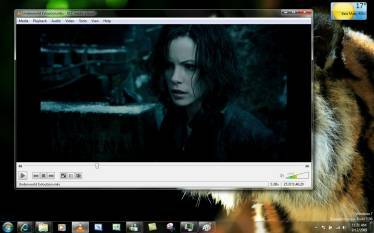 x264 Tha x264 'na aplacaid shaor airson còdachadh de shruthan video dhan fhòrmat H.264/MPEG-4 AVC. 'S e buidheann neo-phrothaideach a tha ann an VideoLAN. Tha sinn a' paigheadh nan cosgaisean uile againn le tabhartasan a gheibh sinn on luchd-chleachdaidh againn. Ma tha bathar VideoLAN a' còrdadh ribh, nach cuir sibh taic rinn le tabhartas? Tha VideoLAN 'na bhathar-bog le còd fosgailte. 'S ciall dha seo gu bheil sinn a' cur fàilte air do chom-pàirteachas ma tha na sgilean ceart agad is ma tha thusa deiseil is deònach. Tha sinne dhen bheachd gur e VideoLAN am bathar-bog as fhearr a tha ann agus aig deagh phrìs: saor an-asgaidh. Mas e sin do bheachd-sa cuideachd, nach innis thu do dhaoine eile gu bheil seo ann?